Writer’s Note: My apologies for giving away the entire plot but c’mon, you knew it already. Dance, human! Dance! 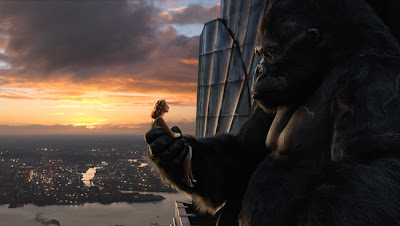 As King Kong watches Naomi Watts as Ann Darrow juggle, make funny faces, do summersaults, all in an effort to communicate with this giant ape who has taken her captive, he can’t seem to bring himself to accept her as the sacrifice she was intended. Laughter has bridged the gap between beauty and beast and allowed what seemed like a hopeless situation for Darrow become a comforting one. It is a pivotal moment that showcases the deeper meaning of KING KONG, Peter Jackson’s three-hour epic remake. This twist of fate reveals Kong as sensitive, docile, misunderstood, a simple monkey trapped in a 25-foot ape’s body, who just needed someone to listen, to look past the roaring tower of strength and intimidation and see the monkey within. It is touching, moving and, perhaps most importantly a great technical feat, but it is pretty much all there is in terms of depth. 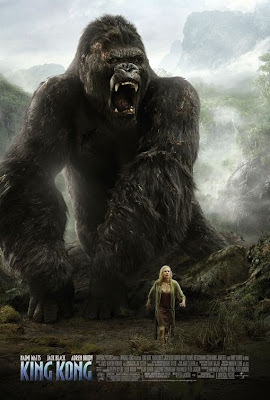 Kong’s style may be impressive, but its size and scope do not lead to substance. And its grandeur leaves you thinking there has to be something more to this. The first act presents Jack Black, trying as hard as he might to play a serious role as reputable film director, Carl Denham, who has a gigantic vision that frightens his producers. They gripe that his films run too long, that he may be ambitious but he can just as easily lose control of the budget. (By the by, did you happen to hear how expensive Mr. Jackson’s KING KONG ended up being?) The parallels cannot help but be drawn and though his films deliver twice over at the box office, I feel a hint of cockiness here. Really, this whole storyline was completely unnecessary. Denham proceeds to steal film stock from his producers when he overhears they aren’t interested in backing him any further before boarding a ship, with both a sea and a film crew, heading to the undiscovered territory known as Skull Island. The boat ride is awash with subplots that get lost at sea and jokes that fall flat in the water. I felt like I was drifting. Until finally, Skull Island is accidentally discovered. Once the crew sets foot on this eerie isle, the film grabs your senses and shakes them repeatedly. Jackson’s imagination takes to the screen as Darrow, Denham, Jack Driscoll (Adrien Brody) and the numerous other seamen fight their way out of one harrowing situation after another and another and another! Tribe people who look like apple granny dolls with stakes through their noses and eyes rolled back in their heads, make way for swamp creatures that turned my stomach over and over while I turned my frightened eyes away from the screen. The crew try to wiggle their way out of dinosaur stampedes and an ambush of legions of over-sized insects. All the while, they search for Anne Darrow with the threat of King Kong looming over all their narrow escapes. 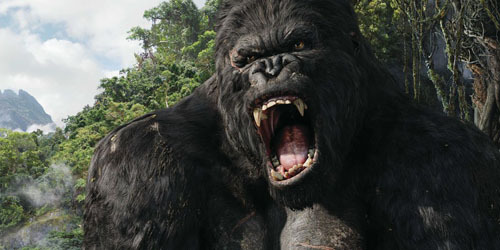 Watts makes Anne Darrow, and KING KONG itself, worth all this effort. She is luminous and charming as a vaudevillian actress who just wants to bring a little laughter to this troubled world. She communicates emotions as vast as fear, love, sympathy and hope through her eyes and body movements, as her co-star doesn’t speak any language she might know. By the time she is atop the Empire State building with Kong during the iconic climax, her lips say nothing as her eyes scream her disgust for the brutality her fellow humans have shown this gentle creature. As Kong struggles to hold on atop the Empire State, masses of people wait for him to fall. Their faces exude superiority, not the kind felt by the privileged, but the kind felt by the entire human race that there is no other species above us. Suddenly, Jackson’s intentions shine through like the sunset of a CGI sky. As Kong falls from his perch, mankind can rest easy once again, having conquered its fear with violence and destruction and without having bothered once again to understand the unfamiliar. Luckily for Kong, Anne Darrow was there with love in her eyes before he fell. B?! You gave Kong a B?! Ugh. D, maybe a C tops. Take out an hours, then maybe it would be a B.